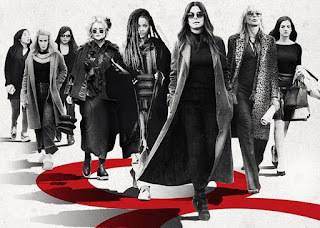 GRRRR...EIGHT: "Ocean's Eight" Is An Enjoyable Film In It's Own Right. The Ocean's Eleven reboot series of films, starring George Clooney, Brad Pitt, and Matt Damon, among others, was a successful franchise under the auspices of Steven Soderbergh. After the untimely demise of beloved cast member Bernie Mac, it was agreed among the cast that they could not continue the franchise without him, ending their run with 2007's Ocean's Thirteen. However, Hollywood isn't known for letting a good idea (and potential profit) go to waste. Thus, the reboot/spin-off Ocean's Eight is born, the concept retooled with an all-female main cast. A risky proposition, given the reception of the previous all-female reboot/spin-off of Ghostbusters (2016) both in terms of box office and opinion. The risk here was worth it. Eight stands as its own entertaining entity even as it respects and pays homage to the films that came before. Upon her release from prison after having been framed for a crime she (for once) did not commit, grifter Debbie Ocean (Sandra Bullock), sister of the late Danny Ocean (George Clooney) devises a plan to pull of a multi-million dollar jewelry heist from the upcoming Met Gala. To pull it off, she enlists the aid of her bestie Lou (Cate Blanchett), and associates Amita (Mindy Kaling), 9-Ball (Rihanna), Tammy (Sarah Paulson), Constance (Awkwafina), and Rose Weil (Helena Bonham-Carter) to pull the job. And if she can get some payback while doing so, so much the better. The previous Ocean films ostensibly represented flash and style, but this film make them seem frat boy-ish in comparison. The main actresses carry themselves with an aplomb that distinguishes them from the original cast (yes, even among the octet's more urbane members). Of course, this could be a carry-over effect given the film's setting (the sophisticated New York art scene replaces the Las Vegas flash and dash), but it helps to cement this series as it's own entities, even if a couple of cameos give a respectful and poignant nod to what came before. Even franchise composer mainstay Daniel Pemberton's orchestrations give the film a musical identity that stands on its own even as it peppers it with acoustical tribute to its cinematic beginnings. The film has a brisk yet understated pace, bolstered by an intelligent script that manages to make a complicated heist easy to follow. Director Gary Ross focuses on character building moments which manage to remain as entertaining as the heist itself. In fact, it's the characterization that fuels the plot. Bullock's Debbie Ocean has a countenance of marble and a poise of cool detachment which belies the simmering emotions that seethes beneath the exterior. Blanchett's Lou is brash and serves as perfect counterpoint to her sister from another mister. The rest of the cast is entertaining, but the standouts are Bonham-Carter as the off-center and teetering on financial ruin fashion designer, Rihanna as the hacker with the devil-may-care attitude, and especially Anne Hathaway as the Hollywood It Girl de jour who is not quite what she seems; her performance being one of the film's highlights. The film has its shares of laughs, though not to the extent of the previous entries. By the same token, it's still joyous as it never takes itself too seriously. The cast must have had a great time shooting the film because it shows in the performances. If there are any weaknesses in the film, it's the lack of dramatic urgency which a bit of swapping of scene positions in the narrative could have addressed. While it might mar the film, it doesn't derail it. The energy among the cast, replete with surprise cameos that celebrate women of film outside of this series, makes it a pleasure to watch. 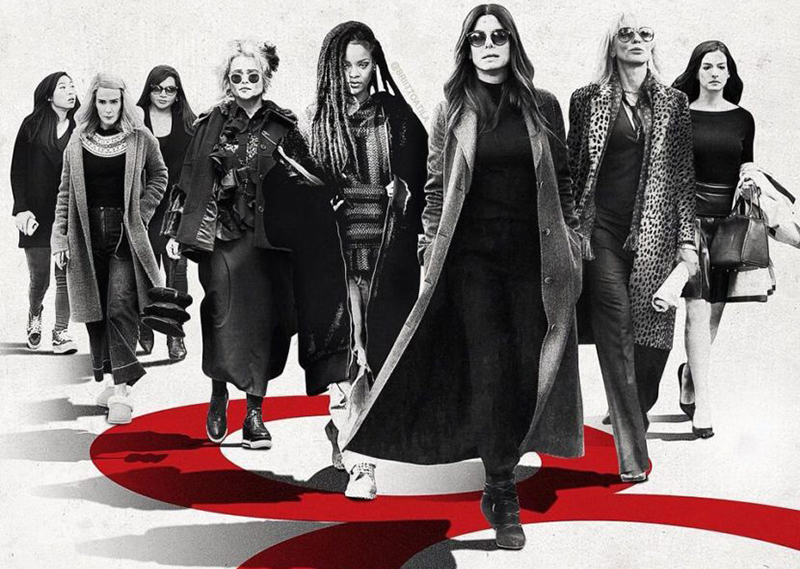 In sum, it would be a crime not to steal away some time to experience Ocean's Eight as it's a smart heist film that does justice to what came before, while showing promise for what is to come. Hollywood can't let go of a good thing, and Eight is a very good thing.